Updated! Apparently Disney didn't forbid the scene, because they never saw it. Director James Gunn took to Instagram to clear up the story. It boils down to this: He shot it with a double (seen in the pic below) but before the real Stan could film it, decided it was too similar to Star-Lord's finger gag. Good call! Original Article: In Guardians of the Galaxy's pre-requisite Stan Lee cameo, Stan is seen macking on a much younger woman, much as he does in real life. But director James Gunn revealed he had a different cameo for the Marvel mastermind planned, but one that Disney refused to let him film. 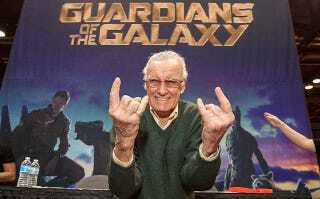 One of the losing battles regarded Stan Lee's original cameo in the film. Originally, Gunn had planned to have Lee in one of the Collector's exhibits. Groot would then look at the exhibit aghast, to which Lee would flick off the large tree creature. I assume this is because Disney didn't want to tarnish the Marvel brand by having its main, non-fictional spokesperson do something so uncouth, but I prefer to think that Disney execs were more appalled at the idea of anyone giving Groot grief in any way because Groot is adorable. However, I can easily see GotG's post-credits tag with Stan Lee in the Howard the Duck role, comforting the Collector — in fact, that scene might have been funnier if Lee had been introduced earlier and shown as imprisoned. But whatever; it's not like Howard the Duck was bad.